Hot off the heels of their acclaimed “East of Sun” debut, Canada’s GATEKEEPER strike while the iron is hot with the “Grey Maiden” EP, featuring a scorching new cut, re-recording of an old favorite, acoustic song and cover of an obscure NWOBHM track. The metal scene moves fast. Hundreds of releases are made available every month from new bands jockeying for position or veteran outfits doing their best to keep up with the times. It simply may no longer be feasible to release an album, support it with some shows, then disappear for two years only to do it all over again. Such is the line of thinking for Canada’s GATEKEEPER, who return in 2019 with the four-song “Grey Maiden” EP. 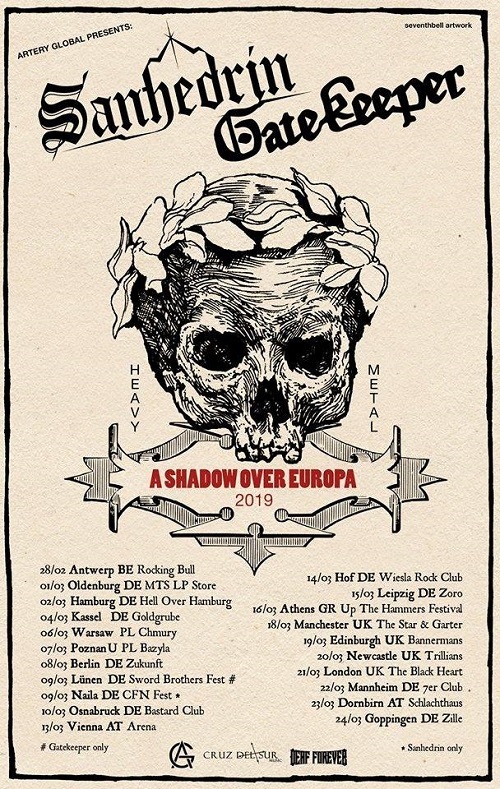 The follow-up to their successful “East of Sun” full-length debut, “Grey Maiden” includes the brand-new title track and acoustic “Moss,” a re-recording of “Tale of Twins” from their first demo and a cover of “Richard III” by obscure NWOBHM outfit Tredegar. GATEKEEPER — who consist of vocalist Jean-Pierre, guitarist/founding member Geoff Blackwell, lead guitarist Kenny Kroecher, bassist David Messier and drummer Tommy Tro — originally had the idea to record an EP after being asked by Skol Records to contribute to their NOWBHM compilation, Grandbreton Invasion. Figuring they were already going to be ensconced in the studio recording “Richard III,” Gatekeeper decided to waste no time in pulling the “Grey Maiden” EP together, providing their fans with an early 2019 treat. In fact, the members of GATEKEEPER are more apt to drop obscure metal references then they are to vouch for the scene’s more prominent bands. Blackwell considers it to be their “bread and butter,” born from the never-ending desire to find bands off the beaten path who could offer something new and vibrant to influence GATEKEEPER’s sound. This pursuit of individualism is one of GATEKEEPER’s defining traits — they easily elude many of melodic and power metal’s stylistic trappings on both “East of Sun” and “Grey Maiden”. The new year will find GATEKEEPER hitting Europe with labelmates Sanhedrin in addition to hunkering down with a brand-new batch of songs for an eventual sophomore full-length release. “Grey Maiden” is hardly a stopgap release, but another bold proclamation from a band who appears to be just getting started.